On Monday 24th of April 1916, a hot spring morning, war erupted in the streets of Dublin! ‘We are going out to be slaughtered,’ Connolly said matter of factly to a friend as he marched his men from Liberty Hall. ‘It’s madness but a glorious madness and I am with you,’ the O’Rahilly said to Constance Markievicz, who was second in command to Commandant Michael Mallin at Stephen’s Green. 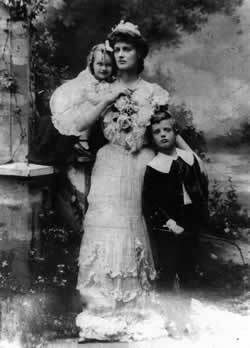 The ‘blood sacrifice’ had begun and Madame Markievicz’s part in the fight is well known. But what of her only daughter Maeve? Did she have children? Are there living descendants of the ‘rebel countess’ today? Maeve, named after the legendary Queen of Connacht, was born to Constance in Lissadell, Co Sligo on 13 November 1901. Her father, Con’s husband, was Count Casimir Dunin-Markievicz a tall, handsome Polish nobleman whose family owned an estate at Zywotowka in the Ukraine. He already had a son, Stanislaw, from a previous marriage. Very soon after the birth Constance became re-immersed in the political and philanthropic activities that were to absorb her for the rest of her life. 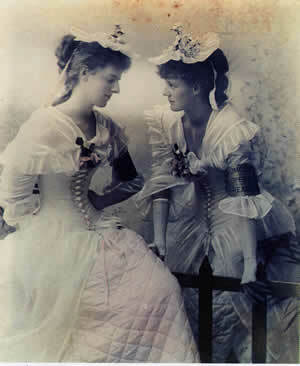 Maeve’s grandmother, Lady Georgina Gore-Booth, took charge of the infant and although Constance visited frequently, in time the relationship between the grandmother and granddaughter developed into one more like mother and daughter. At the age of 14 Maeve was sent to an exclusive English school. It was here news came of the Easter Rebellion of 1916, and, as was to be expected in such a setting, she achieved a doubtful notoriety as ‘The Rebel’s Daughter’. As she grew older, she developed a great admiration for her mother’s emancipation and hoped one day to follow in her footsteps. Lady Georgina, hoping for a more conventional future for Maeve as an Anglo Irish socialite arranged to launch her on a London season. The trivial round of the social whirl appealed even less to Maeve than it had to her mother, and lasted even shorter. Bowing to the inevitable Lady Georgina reluctantly sent her granddaughter to Swanley Agricultural College for Women where she eventually graduated with B.Sc. (Hort) degree. Following the death of her mother in July 1927 Maeve severed almost completely her links with Ireland. Except for short holidays, England now became her home. Around 1935 she tried her hand as a maker of home made sweets hoping to make a commercial venture of it. During World War II she took up work with the ‘Land Girls’ in Somerset and because of her training was assigned as a Labour Officer. She was later moved to Kent and during the final phase of the war was back teaching at Swanlea College. After the war she took up reclaiming and planning gardens around Hampstead that had been allowed to run wild during the war years. In 1956 she decided to emulate her mother and try her hand at painting. With the same energy that had characterised Constance in her projects, Maeve made such progress in her new hobby that within two years she had achieved her first exhibition in Hampstead, England. Two years later she held her first Irish Exhibition in Dublin, which was opened by the Taoiseach Mr. Lemass. But painting Irish scenes from memory in London had its drawbacks. More and more Maeve returned for inspiration to the landscape that had inspired Eva Gore-Booth and both W.B. and Jack Yeats. Sligo to recuperate. There she renewed old ties, knew again the feeling of belonging to a countryside. She spent Christmas at Lissadell little knowing that it was to be her last. Her visit lasted three months until she returned to England to collect her Old Age Pension. During this visit to Sligo she painted feverishly all the familiar haunts of her childhood. Her own favourite of this latter period was of Cloonagh, that spot immortalised by her Aunt Eva in the poem The Little Waves of Breiffny. As if to emphasise the difference of the natures of aunt and niece, Maeve painted the angry waves of Breiffny. Lissadell House, and scenes from the house, she painted from all angles, almost as if she wanted to impress their image even more deeply in her memory; for as with her mother, however much they both rebelled against the Lissadell landlord tradition, it always remained their spiritual home. Everywhere she went during this visit, memories of the past appeared. Old men repeatedly told her of various exploits of her mother’s horsemanship for which she is well remembered in the countryside. One old man recalled the event from when he was a boy of a day at Claragh Point-to-Point races. He watched Constance and Major O’Hara fight out a finish in the open race. Both approached the winning post locked together. Just when it seemed that it must end in a dead heat the lady’s mount nosed slightly in front and flashed past the post. Before she could rein in, the horse collapsed under her. Immediately all was confusion with everyone shouting orders and cross-orders. Con in her elegant bottle-green riding habit got down in the muck, lifted the horse’s head onto her lap and quickly sent her groom for whiskey. She administered the liquor to her mount, nor did she move from the spot to change her wet and dirty clothes until she had the horse on his feet again and walking about. There can be no doubt that this visit to Sligo gave Maeve great pleasure. Shortly after her return to London she wrote to a friend in Sligo: ‘It is very pleasant to feel that at my age I can still make new friends’. While her new, and old friends, may rejoice that her last memory of Sligo was such a pleasant one, they cannot but regret that her passing has broken the last link with what might be called ‘Sligo’s Golden Age’: the time of the Yeats family and of Eva and Constance Gore-Booth. Ice blue on Sligo Bay. 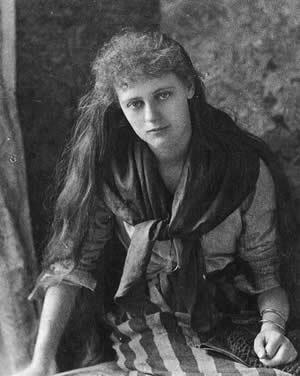 “The death has occurred at her home in Parliament Hill, London of Miss Maeve de Markievicz” was the last echo of the first shot fired in the Easter Rebellion of 1916. Maeve was the end of the line, the only descendant of a remarkable Sligo woman who flashed like a meteor across the heavens with the dawn of the Irish Republic.